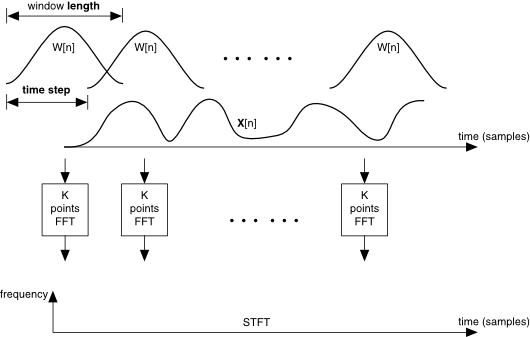 Computes the signal energy distribution in the joint time-frequency domain by using the short-time Fourier transform (STFT) algorithm. Configuration of the FFT size of the STFT. This input determines the number of columns in the output STFT spectrogram. This input is available only if you wire a waveform or a 1D array of double-precision, floating-point numbers to x.
force freq bins to power of 2? A Boolean that determines whether to coerce the frequency bins to a power of 2. If this input is True and the frequency bins is not a power of 2, this node sets the frequency bins to the nearest power of 2. True Coerces the frequency bins to a power of 2. False Does not coerce the frequency bins to a power of 2. A Boolean that determines whether to exclude the energy at the Nyquist frequency from the output STFT. True If the FFT size of the STFT is even and this input is True, the output STFT does not include the energy at the Nyquist frequency. False Includes the energy at the Nyquist frequency. If the FFT size of the STFT is odd, this node ignores this input. The density to use to sample the signal in the joint time-frequency domain and to define the size of the resulting 2D time-frequency array. This input changes to time steps if you wire a double-precision, floating-point number to x. Number of samples to shift the sliding window. When this input is less than or equal to zero, this node adjusts this input automatically so that no more than 512 rows exist in output STFT. If you specify a small value for time steps, the node might return a large spectrogram, which requires a long computation time and more memory. NI recommends you set time steps so that the number of rows in STFT spectrogram does not exceed 512. If you need a small sampling rate to observe more details and the signal length is large, divide the signal into smaller segments and compute the spectrogram for each segment. FFT size of the STFT. If this input is less than or equal to zero, this node sets the input to 512. If this input is 1, this node coerces the input to 2. Number of samples to shift the sliding window. time steps must be greater than 0. This input changes to time-frequency sampling information if you wire a waveform or a 1D array of double-precision, floating-point numbers to x. Increasing time steps decreases the computation time and reduces memory requirements but also reduces time-domain resolution. Decreasing time steps improves time-domain resolution but increases the computation time and memory requirements. Information about the window to use to compute the STFT. Type of window to use to compute the STFT. Blackman Nuttall 11 Applies a Blackman Nutall window. Length of the window in samples. When you wire a waveform or a 1D array of double-precision, floating-point numbers to x, this node sets the input to 64 if length is less than or equal to zero. When you wire a double-precision, floating-point number to x, length must be greater than 0 and less than or equal to the sample length. A Boolean that determines whether to scale the STFT spectrogram so that the energy in the joint time-frequency domain equals the energy in the time domain. True Scales the STFT spectrogram so that the energy in the joint time-frequency domain equals the energy in the time domain. False Does not scale the STFT spectrogram so that the energy in the joint time-frequency domain equals the energy in the time domain. A 2D array that describes the time waveform energy distribution in the joint time-frequency domain. To compute the output STFT Spectrogram, this node completes the following process. Computes the STFT of the input signal x by using a sliding window to divide the signal into several blocks of data. Applies an N-points fast Fourier transform (FFT) to each block of data to obtain the frequency contents of each block of data, where N is the input frequency bins. The STFT aligns the center of the first sliding window with the first sample of x and extends the beginning of the signal by adding zeros. The sliding window moves time steps samples to the next block of data. If the window moves out of x, this node pads x with zeros. The following figure shows the procedure this node uses to compute the STFT. where [ ] is the nearest operation. Otherwise, K is equal to frequency bins.